I’ve known Alexandrine Roy (pronounced “wah”) for years, and used to buy her wines at retail shops and restaurants before becoming her importer. I was a fan first, never thinking we’d have the opportunity to work together. She is quickly becoming the face of the ‘new” Burgundy, and a recent New York Times article chose hers as one of the two best Burgundies anywhere under $100! It was Marc Roy’s grandfather who started the estate with just a few tiny parcels of vines in one of Burgundy’s most famous villages, Gevrey-Chambertin. In 2003 Marc’s daughter Alexandrine took control of the domaine, which has now grown to just under 10 acres. Alexandrine is simply one of Burgundy’s brightest rising stars, and is a regular on U.S. shores. She’s here often, promoting her wines and charming wine lovers coast-to-coast, as well as making wines in Oregon for Phelps Creek Vineyard in the Columbia Gorge. “Alex” is a regular at the annual International Pinot Noir Celebration in McMinnville, OR, where she has made legions of friends and fans over the years. All of the domaine’s holdings are classified at the Village level, as they own no 1er Cru or Grand Cru land. The wines consistently outperform their “humble” origins however, as noted by leading publications and critics who dole out praise and high scores year after year. Alexandrine produces four different bottlings of Gevrey-Chambertin, starting with the “Vieilles Vignes”, produced from her oldest parcels in the village, now 70+ years old. 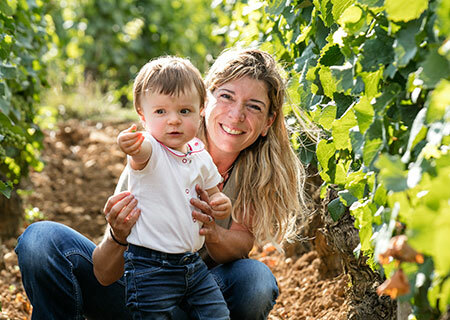 in 2011 she purchased a new parcel of Gevrey-Chambertin “La Justice”, and now makes a single-vineyard bottling from this site every year.“Clos Prieur” is a single-vineyard cuvée, from her parcel below the Grand Cru Mazis-Chambertin. The jewel in the crown is “Cuvée Alexandrine”, produced from only the tiny millerandage grapes, the little shot-berries that have a high skin-to-juice ratio and produce a superior level of depth and concentration. These grapes are harvested individually by hand, as Alex and her parents make a pass through each of their parcels, picking only these special grapes for this flagship cuvée. Additionally, they have a tiny parcel of Chardonnay in the neighboring village of Marsannay, where she makes tiny amounts of a rich and minerally Marsannay “Les Champs Perdrix” from a vineyard high on the rocky hillside above the village of Couchey.